Want to learn how to become a master of marketing from marketers who don’t just know marketing, but know how to write about marketing in a way that is a pleasure to read? Follow the folks on this list. Dorie Clark is a marketing strategy consultant, professional speaker, and a frequent contributor to both Forbes and the Harvard Business Review. Her books on marketing, entrepreneurship, and leadership have been on numerous bestseller lists, and have been translated into Russian, Chinese, Arabic, French, Polish, and Korean. 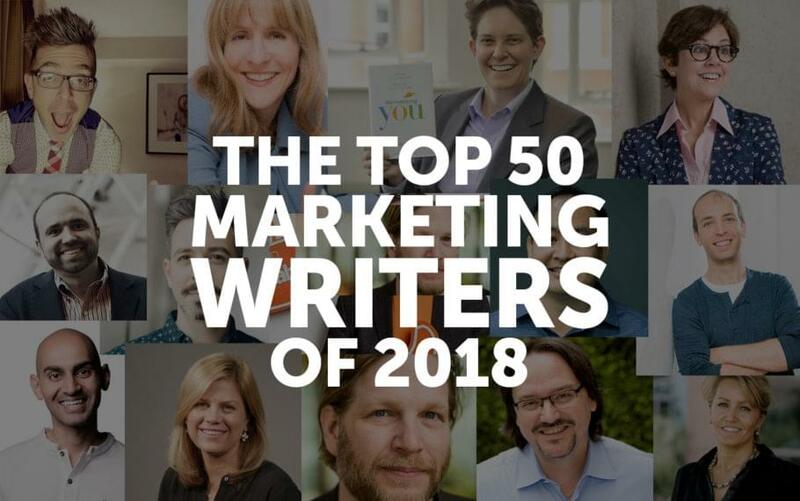 Ann Handley is the Wall Street Journal bestselling author of Everybody Writes: Your Go-To Guide to Creating Ridiculously Good Content and Chief Content Officer of MarketingProfs, a repository of marketing knowledge trusted by over 600,000 people. A content marketer for the ecommerce juggernaut Shopify, Aaron Orendorff’s mission is to “rid the world of bad content.” He’s done his fair share by contributing to dozens of top business publications like Fast Company, Mashable, and Entrepreneur, and he’s got a course to teach others how to do the same. Aaron is the creator of the hashtag #LetsGetRejected and relishes telling stories on social media about his failed attempts at breaking into writing for even more publications. Daniel Marlin is a content marketing consultant, a columnist for both Forbes and Entrepreneur magazine, and a freelance business technology writer. He helps moderate a Facebook community of over 4,000 thought-leaders, entrepreneurs, and authors-where he shares smart ways influencers can build their brand, authority, and business through powerful content, marketing, and growth hacks. Neil Patel is one of the world’s most highly regarded digital marketers with a career that spans back to the tender age of 16. While he has started many well known companies, and writes for numerous business publications, it is his blog (which receives almost 1.1 million monthly readers) that he is arguably most famous for. Brian Dean is the founder of Backlinko, a blog that shares actional advice on SEO and content marketing strategies. His content is some of the most well-researched and innovative in its field, and as such he has garnered a loyal following of entrepreneurs and marketers eager to learn about the latest trends in search engine marketing. Cheryl Conner is the founder and CEO of SnappConner PR, a regular contributor to Forbes and the Wall Street Journal, and the creator of Content University. Her most popular Forbes article has received more than 10.5M views, has been syndicated in Fox Business, and reprinted in publications around the world. Cheryl speaks and writes extensively on PR, and teaches experts how to write and tell their stories better. John Rampton is a serial entrepreneur, prolific business writer, and was named one of 25 marketing influencers to watch in 2017 by Forbes. He has spoken all over the world, and continues to coach countless entrepreneurs on how to grow small ideas into million dollar businesses. Derek Halpern is the founder of Social Triggers, a blog that teaches entrepreneurs how to apply consumer psychology to their online marketing, and his content has helped many aspiring business owners grow their blogs and monetize their audience. Derek also has a daily YouTube vlog where he shares a behind the scene look at his organization, personal life, and marketing strategies. Kimberly Whitler is a former CMO with over 20 years of international experience. As a Forbes columnist, and an assistant professor at the University of Virginia’s Darden School of Business, Kimberly explores the challenges that face contemporary marketing executives. Rand Fishkin is the co-founder of Moz, one of the world’s most popular search engine marketing platforms. Affectionately known as ‘The Wizard of Moz’, Rand also hosts the popular video series, Whiteboard Fridays, where he shares his insights on content marketing and the evolving landscape of search engine optimization. Robert Rose is the founder of The Content Advisory, a platform that teaches audiences how to build an online audience. He also co-hosted the This Old Marketing Podcast, which ended production in December 2017 but is still worth perusing as an archive of fantastic marketing wisdom. Joe Pulizzi is the author of five books, co-hosted the This Old Marketing Podcast with Robert Rose, and is the founder of Content Marketing Institute. He is the organizer of Content Marketing World, the largest content marketing event on the planet. Dennis Yu is the CTO of Blitz Metrics, a digital marketing firm that trains young professionals in the fundamentals of internet advertising. He co-authored a textbook on Facebook marketing which is taught in over 700 colleges and universities, and his insights have been featured everywhere from the Wall Street Journal to TechCrunch. John Hall is the CEO of Influence & Co, a company that helps people develop their influence and thought-leadership. John writes regularly for various business publications, where he shares insights on everything from building client relationships, to better understanding your marketing metrics. Melanie Deziel is on a mission to educate people about the power of brand storytelling. She travels the world giving keynote presentations and workshops on branding, and shares everything that she’s learning along the way. Chris Brogan is a New York Times bestselling author of nine books and counting. He has consulted and spoken for some of the world’s most recognizable brands like Coca-Cola, Disney, Google, and Microsoft, and has appeared on the Dr. Phil Show. Chris has shared the stage with some of the hottest names in entrepreneurship, including Tony Robbins and Richard Branson. Leonard Kim is a managing partner of Influence Tree, a company that teaches experts how to build their personal brands. He’s amassed hundreds of thousands of social media followers, dozens of press mentions, and his answers on Quora have been read by millions. Jeremy Knauff is the founder of Spartan Media, a US Marines veteran, and a regular contributor to both Search Engine Land and the Search Engine Journal. He has almost two decades of digital marketing experience, which he shares with his readers as they strive to learn more about marketing their businesses in a competitive digital landscape. Chandler Bolt is the founder of Self-Publishing School, and the author of six Amazon bestselling books. He also hosts the Self-Publishing School podcast where he teaches experts and entrepreneurs how to write, publish, and market their first book. Dave Kerpen is an entrepreneur, New York Times best-selling author, and reality TV personality. He writes about how business owners can leverage social media to grow their customer base, and he has steered many ventures in the enterprise social media space. Kerpen is also famous for orchestrating his $100,000 wedding, paid entirely by sponsors, which received significant media attention in 2006. Chirag Kulkarni is the founder and CEO of Taco, a content and digital marketing firm that helps brands build their online presence. He is also a regular contributor to Entrepreneur, Business Insider, and Fortune Magazine, where he writes about PR, SEO, and social media amongst other things. While arguably more famous for his video content, Scott Oldford is a highly regarded marketer whose insights have been featured on many of the world’s top business publications. His content focuses on everything from sales funnels, Facebook Messenger bots, and how entrepreneurs can become the most relevant personalities in their niche. A content marketing veteran, Sherry Gray writes extensively on blogging, social media, and content marketing related topics. Her byline has been featured on Entrepreneur, AdWeek, Huffington Post, and Content Marketing Institute, and she helps moderate a large online community of influencers and aspiring writers. Brian Evans is the founder of Influencive, an online publication that shares tips on how people can build more influential brands and businesses. A regular contributor at Entrepreneur, Forbes, and other publications, Brian has a vibrant online following that hungrily consumes his writing and unconventional wisdom. Jennifer Rooney is a Forbes staff writer and editor. She moderates the Forbes CMO network, where she creates and curates content relevant to executive-level marketing decision-makers. She has interviewed hundreds of CMOs and CEOs during her time at Forbes, and also oversees the 30 Under 30 nominations for marketing and advertising. Ben Settle is a copywriter and world leader in the email copywriting space. His blog contains over 1,000 pages of copywriting secrets, email-marketing trends, and industry reports, all of which he expands upon in his popular daily email newsletter series. Dubbed ‘The CMO Whisperer’ and ‘The Distiller of Truth’ by Fortune 500 CMOs, Steve Olenski knows the mind of the marketer as well as anyone. He has interviewed and established close relationships with more CMOs and marketing leaders than I can count (not that I’m that great with math, but still). Buy him a cup of coffee and he’s your friend for life. Literally. David Meerman Scott is an online marketing strategist and best-selling author of over 10 books. He dissects the differences between online marketing and mainstream marketing and how the rules have changed for businesses operating in the digital age. David is also a prolific public speaker who has keynoted events in over 40 countries around the world. Kathy Klotz-Guest is a speaker, author and workshop leader that specializes in business and brand storytelling. On her blog she shares valuable tips and techniques that marketing professionals can use to build stronger, more exciting brands (including improv, collaborative sessions, and the fundamentals of storytelling). Ryan Levesque is a former neuroscientist, national bestselling author, and founder of the Ask Method. He teaches entrepreneurs how to use online quizzes as an effective form of lead generation and marketing segmentation, and his insights have been published widely across the internet. Perry Marshall is a veteran Facebook advertiser, published author, as well as a prominent theological thinker and activist. He is most famous for his book, The Ultimate Guide To Facebook Advertising, in which he discusses a variety of tactics people can use to grow an online business using social media marketing. Jeff Walker is the mind behind some of the internet’s most successful and viral product launches. He is also the author of the #1 New York Times bestselling book, Launch, in which he shares his formula to selling just about anything online. Jeff teaches and inspires other online marketers with blog posts and resources made readily available on his website. Sam Horn is an international keynote speaker, author of over ten books, and a communications strategist that has worked with some of the world’s biggest brands. Her writing focuses on developing and delivering intriguing sales pitches, and has been featured in the New York Times, Fast Company, Forbes, and other top publications. Marcus Sheridan is a content marketing consultant and keynote speaker. He’s delivered dozens of workshops and penned numerous articles on the future of digital marketing and the evolution of consumer behavior. Marcus also wrote the #1 content marketing book of 2017 according to Mashable, in which he explores a revolutionary approach to inbound marketing. Jay Baer is an entrepreneur, internet pioneer, and bestselling author of five books. He writes about marketing and customer service on his blog Convince and Convert, and shares strategies on how business owners can attract more customers and keep the ones they already have. Jeff Goins is a copywriter, popular blogger, and the best selling author of The Art Of Work and Real Artists Don’t Starve. His goal is to help people harness their creativity to create great products, books, or works of art worthy of sharing with the world. Darren Rowse is the founder of Problogger, a platform that connects bloggers from around the world, and teaches them how to create great content, build an audience, and make money doing what they love. Problogger has over 8,000 articles in its archives, all of which is made easily accessible to its readers. Brian Clark is the founder of Copyblogger and Rainmaker Digital, a leading platform in the content marketing space. Brian doesn’t just teach content marketing, he built his companies with it, and through his platforms he strives to help other bloggers and entrepreneurs do the same by creating remarkable content of their own. Michael Stelzner is the founder of Social Media Examiner, the world’s largest social media resource that helps millions of businesses learn how to use social media to connect with their customers. He also helps organize Social Media Marketing World, an annual event that attracts the best minds in social media who discuss the latest industry trends. Travis Wright is a technology blogger and self-described marketing provocateur. He shares marketing strategies and industry analysis with a comedic twist on his blog. Travis is also a popular keynote speaker, and has talked extensively on marketing related topics all across the world. Jon Loomer is one of the world’s most highly regarded Facebook advertising bloggers and consultants. His blog has been ranked in the top 10 social media blogs three years running by Social Media Examiner, and is a go-to resource for anybody looking to make sense of Facebook advertising. Larry Kim is the CEO of MobileMonkey, which helps marketers build Facebook chatbots, and he’s one of the most prolific expert marketing writers in the world. He is a regular contributor to CNBC and many other business outlets where he writes about how to grow startups using tried and tested, as well as cutting-edge, digital marketing strategies and tactics. Chad Pollitt is prolific marketing writer whose insights have been published in over 30 top business and marketing publications including Forbes, Hubspot, and the Guardian. He is also an adjunct instructor of content marketing at the Rutgers University Business School. Oli Gardner is the co-founder of Unbounce, a marketing and conversion expert, and a top-rated public speaker. He shares valuable resources on landing page and conversion rate optimization, Pay Per Click advertising, and how to grow your startup with digital marketing. Andy Crestodina is the co-founder and CMO of Orbit Media Studios, an award winning web design agency. He’s been a prominent figure in the digital scene since 2000 and together with his team he has produced hundreds of articles that educate people about ethical digital marketing strategies. Jonah Berger is a professor at the Wharton School of the University of Pennsylvania, and the #1 New York Times bestselling author of Contagious. He explores the dynamics behind word of mouth advertising and the invisible factors that cause things to go viral online. Ryan Holiday is a bestselling author and media strategist. He is notorious for his PR stunts and unorthodox marketing campaigns, has written extensively on media manipulation, the foundations of marketing work that lasts, and how to growth hack your business using PR and futuristic marketing tactics. Michael Brenner is a marketer, consultant, speaker, and author. He helps brands tell engaging stories that attract new customers, and teaches them how to create and optimize content to achieve their goals. His work has been featured on the Economist, The Guardian, and Entrepreneur magazine. Al Ries is a member of the marketing old guard. He is famous for coining the term “positioning”, and has consulted for companies like Microsoft, Samsung, Disney, and Ford. He co-authored a three part series of articles that revolutionized marketing in the late 1970s, and his work on positioning has been credited as one of the most influential marketing concepts in the last 75 years. The tricky part about creating a list like this is that inevitably I’m going to leave 500 people off who would fit here just as well as anyone. Who did I miss? Tell me in the comments below.